Girls should not waste their time with sugar daddies who have already reached the end of their lives and are about to die, Social Development Deputy Minister Hendrietta Bogopane-Zulu warned learners at the Promosa secondary school during a substance abuse awareness campaign held in the area. On Monday Deputy Minister of Social Development Hendrietta Bogopane-Zulu and NW newly appointed MEC for Social Development Hoffman Galeng visited learners to warn them about the dangers and effects of substance abuse. “You still have a lot of good things awaiting you. Don’t waste your time with blessers. Don’t allow yourself to be abuse sexually and emotionally even at home. Keep your bodies clean,” Bogopane Zulu said to the girls who stood on their feet to make a declaration to lead a drug free life. On the contrary Bogopane-Zulu urged boys to make vows not to become teen fathers or become “Ben 10’s. Bogopane-Zulu said alcohol stays 10 years in the system if girls take it below the age of 18. This, she said would make girls to give birth to disabled children. 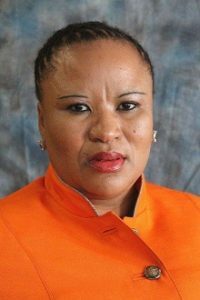 Meanwhile NW’s newly appointed MEC for Social Development Hoffman Galeng said his department is more than ready provide rehabilitation service to young people who are willing to do away with drugs and substances. “We have constructed two state-run In-patient treatment centres in this municipality including Greater Taung Local Municipality. All of these centes are at 100% practical completion. We are currently in the process of operationalizing these facilities so that our people lead a drug-free life. We have set aside amount of R74.9m to turn around the lives of our people by waging a winnable war against drug addiction,” Galeng said. On Wednesday Galeng and Bogopane-Zulu are scheduled to launch Siyalulama outreach programme and a five year plan of action on prevention of substance abuse amongst children and youth at OR Tambo community hall in Ikageng Extension 7, NW 405 municipality. Siyalulama translated as “we are getting better” or “reclaiming our lives” is meant for people living in the streets especially youth abusing drugs. Siyalulama prevention programme will also cover hotspots where children and youth spend time indulging in various substances.